A little movie shot in the bayous has revived the question of our image as it is projected on the big screen. Beasts of the Southern Wild took the critics by surprise with its young actor Quvenzhané Wallis in the role of Hushpuppy Doucet. Positive reactions seem to be quasi-universal, covering with praise this work, the first feature film by the director, Behn Zeitlin, for its lyrical poetry and dreamlike quality. He lived for a year with the inhabitants of Isle de Jean Charles, this hint of a village that served as the inspiration for the Bathtub, the setting of the film. He arrived as if blown in by the winds of Katrina to understand this region and the people that inhabit it. From this long engagement was born the last of a long series of films about us shot from the outside looking in. This is not the first time the exotic geography and the unique people of Louisiana drew the attention of practitioners of the seventh art. The first Tarzan of the Apes has as decor not Africa but the wetlands near Morgan City. This silent film initiated a kind of Hollywood tradition to make the relatively short and inexpensive journey here when one was looking for a distant landscape. Delores Del Rio came to embody Evangeline, our unfortunate national heroine. The "forest primeval" they sought was that of Louisiana. However, our state was already established itself in the American cinematic imagination as a strange and foreign land. Louisiana Story by Robert Flaherty came out after the Second World War. Previously, he had filmed Nanook of the North, a silent film that some people consider a documentary, though Flaherty is accused of having staged some sequences. Louisiana Story, also presented as a documentary, is, at best, an uninteresting fable about the life of a Cajun boy and his pet raccoon, or, at worst, propaganda paid for by the oil industry to tout the benefits of drilling. Whether it's one or the other, this story is not really ours. The reputation of the Cajuns as hard-core killers in the thick and hostile swamp gushes on the big screen just as the nation is discovering Cajun culture with the release of Southern Comfort. 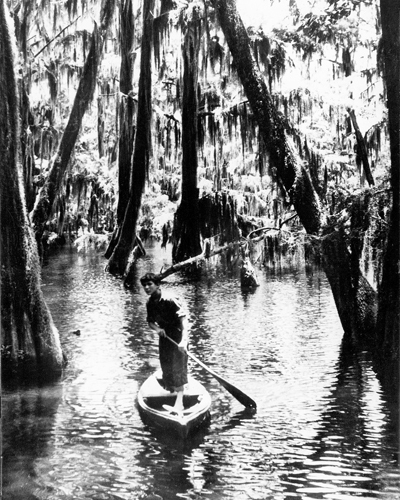 Even today we have trouble distancing ourselves from this image of Deliverance on the bayou. Since then though, there have been positive examples of our culture. With Belizaire the Cajun by Glen Pitre, we began to make movies by us and for us. It was a production that was trying to reflect what the Cajun culture had on the inside and project it to the outside world. Since then, we have had several films and documentaries in this same vein, including the works of Pat Mire or Conni Castille. Our culture was finally presented as we lived it.